Rep. Jim Clyburn (D., S.C.) said back in May that Democratic congressional candidate Archie Parnell should "end his campaign" following revelations of past spousal abuse, but Clyburn is now scheduled to join the embattled candidate for a final campaign event before election day. "Due to the unfortunate circumstances recently revealed, I hereby urge @Archie4Congress to end his campaign," Clyburn tweeted earlier this year. Due to the unfortunate circumstances recently revealed, I hereby urge @Archie4Congress to end his campaign. Parnell ultimately won the Democratic nomination in South Carolina's 5th Congressional District, however, and Clyburn announced Tuesday he would attend the "election eve fish fry" event with him in Sumter. The announcement drew scorn from the National Republican Congressional Committee, which called for him to cancel the event and issue an apology. 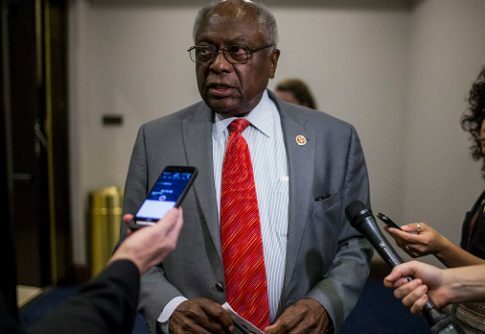 "Congressman Clyburn’s actions aren’t just hypocritical, they’re disgusting," NRCC spokesman Matt Gorman said Tuesday night. In addition to Clyburn initially calling for Parnell to end his campaign, the Democratic Congressional Campaign Committee communications director Meredith Kelly condemned the candidate, saying he "should drop out of this race immediately." She also told CNN the DCCC wouldn't invest in his campaign, even if he won the primary. Trav Robertson, chairman of the South Carolina Democratic Party, also condemned Parnell's behavior after the news of abuse broke, saying he had "no choice but to withdraw from the race." He also said Parnell's behavior "directly contradict[s] the values of the Democratic Party." Parnell's ex-wife, Kathleen Parnell, said their marriage fell apart in 1973 after he made "unwarranted accusations" and became violent, according to divorce records obtained by the Post and Courier. In October 1973, Archie Parnell, then a University of South Carolina student, was locked out of some friends' apartment to protect Kathleen Parnell, who was staying there. At 2 a.m., Archie Parnell used a tire iron to break a glass door, the complaint said. He made more unspecified accusations to Kathleen Parnell before striking her several times. She said she was beaten again later that evening. After the "acts of physical cruelty," Kathleen Parnell said she feared for her life and did not want to stay married. She obtained a restraining order against Archie Parnell after seeking the divorce, according to court documents. The divorce was finalized in early 1974. Confronted with the court records by aides last week, Parnell did not deny the allegations. But even as his staff fled the campaign en masse, he refused to drop out of the race Monday. Parnell expressed remorse when confronted with revelations of the court records, but he repeatedly said he would not drop out of the race. "This campaign has always been about the people of the 5th district, my home, but never about me," Parnell said in a statement. "Forty-five years ago, while still a college student, I did something that I have regretted every single day since. In response to actions I feel unnecessary to specify, I lashed out and became violent with other people, including my former wife, which led to a divorce and monumental change in my life." "These actions were inexcusable, wrong and downright embarrassing," Parnell added. "Since then, my life has been changed by a remarkable woman, two amazing daughters, a forgiving God and a career that has taught me to cherish what I have." Parnell is challenging incumbent Republican Rep. Ralph Norman after previously losing to him in a June 2017 special election. Clyburn faces a challenge from Republican Gerhard Gressmann in the state's 6th Congressional District, which has routinely reelected the congressman by overwhelming margins. This entry was posted in National Security and tagged 2018 Election, Jim Clyburn, South Carolina. Bookmark the permalink.